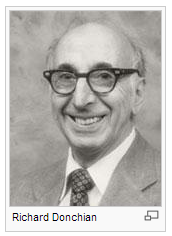 During the "Turtles'" training period, rules were taught that were likely heavily influenced by the works of Richard Donchian (1905-1993), the "grandfather" of "trend following" techniques and founder of the first publicly traded futures fund launched in 1949. Knowingly or not, Richard's work probably echoed strategies used by some succesful ancient Roman merchants, winning Chinese Silk Road speculators before them, and likely many Egyptian traders who were backed by Pharoahs before them. Upon completion of their initial training, the probationary traders were given a small draw and mandated to trade the rules they were taught using real money. Stringent risk parameters were in place. Not all of these trainees were able to follow the rules completely and for some reason or another, were dropped from the program. Read all about in Curtis Faith's book The Way of the Turtle or Michael Covel's The Complete TurtleTrader. Trading is clearly not for everyone... The traders who could adhere in a disciplined manner and manage the emotional roller coaster advanced to the next phase, which was an initial account size allocation of between $250,000 and $1,000,000 of trading capital. The traders then earned a percentage of the trading profits for the next few years. Some were dropped from the program. Without getting into any of the specifics of the original trading rules which are now easily searchable in the public domain, it is worth noting that many of the initial and subsequent "second-generation" Turtles went on to continue their own research after the program ended. 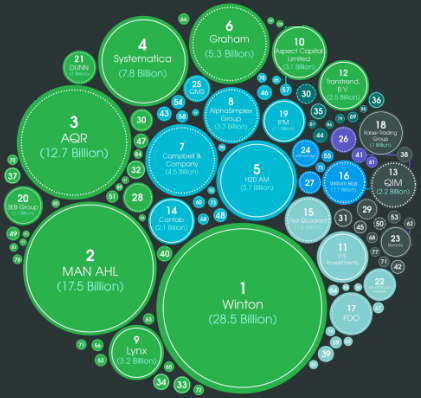 They continued to refine their techniques and are now firmly established as some of the biggest modern-day asset managers, often operating as Commodity Trading Advisors (or CTA's) controlling many billions of dollars of investor capital. 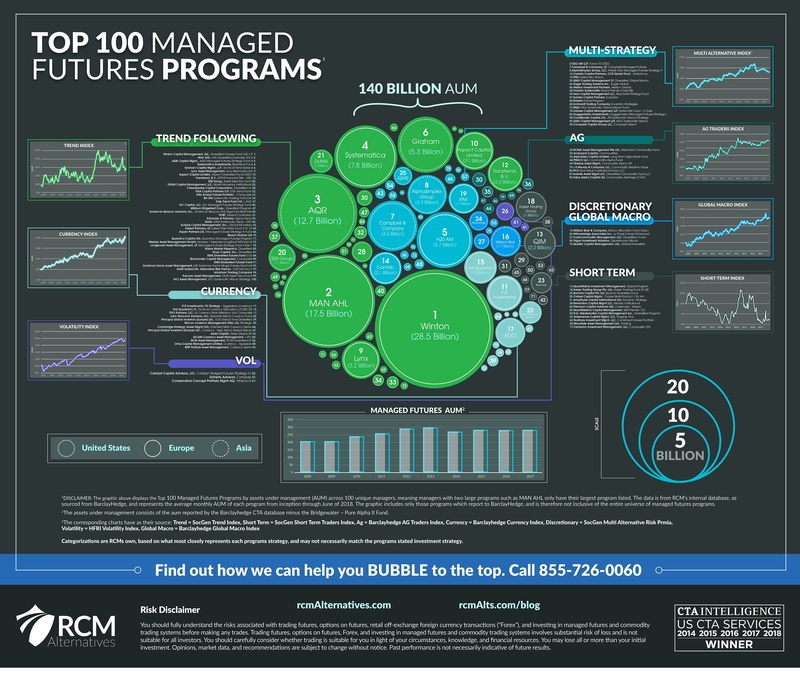 Here is a great infograph from RCM Alternatives showing the 100 largest Commodity Trading Advisors as of August, 2018. Note the size of the "Trend Following" contingency. Some of these firms are direct or indirect descendants of the Original Turtle program. Most of these firms deploy trend following strategies to some degree. We would argue that to a firm, if not participating in trend strategies already, they are at the minimum aware of the techniques - and so too should you be! Which is of course, not to say that trading is easy, anyone can do it, or that there are any magic formulas to guarantee success. Before we learn our 40in20out Index construction rules - which fit easily onto the back of an envelope - there is a minimum understanding of core concepts required and 7 basic trading principles that should be considered first. Please allow us 5 minutes of your time and click through to follow along. And here is a nice interview with Jerry Parker from Chesapeake, arguably one of the most succesful Turtles.